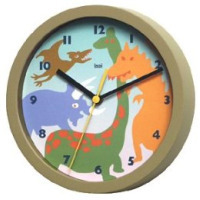 I have recently been trying to teach my kids the concept of TIME. And if you have been through the process, you know how exhausting that can be. With thoughts of Time on my mind, I browsed around to see how the clock manufacturing industry had been doing and found some fascinating stuff. 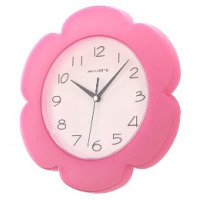 For the more traditional pink kids room, this Pink Petal wall clock would make a perfect addition. And then there are those who want something 'different'. 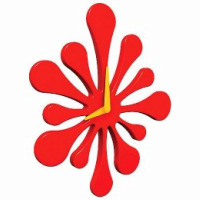 They are more likely to purchase this Splat Clock – I love the abstract shape. 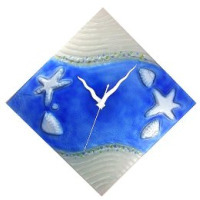 And this Seashell Glass Clock will give your beach themed room just the 'something extra' it needs. 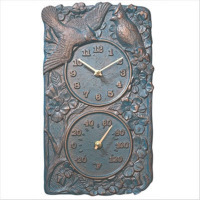 But my heart completely flipped for this 'Made to Order' Cardinal Clock (it even has a thermometer). 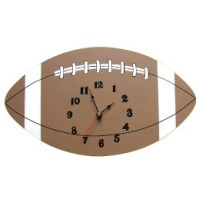 The craftsmanship and the soft colors make these novelty clocks more of an art piece than a timepiece. And the company has many more designs to offer. As I think more about Time and why kids just don't get it...I think, maybe it is us adults who 'just don't get it'. We are so hung up on time and schedules and routines, that we forget that sometimes we need to dump the clock and simply enjoy the moment. Just as kids do. "Our struggle to put first things first can be characterized by the contrast between two powerful tools that direct us: the clock and the compass. 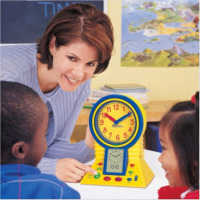 The clock represents our commitments, appointments, schedules, goals, activities - what we do with, and how we manage our time. The compass represents our vision, values, principles, mission, conscience, direction - what we feel is important, and how we lead our lives. The struggle comes when we sense a gap between the clock and the compass - when what we do doesn't contribute to what is most important in our lives". ps. Remember if you have any new projects or questions, you can share them with us. Write to us through our Contact Us form or through any of the other forms we have scattered around the site.